Hyperthyroidism, also known as "hyperthyroid disease," occurs when the thyroid gland enlarges ​and starts producing excess amounts of thyroid hormone (thyrotoxicosis). This anomaly is usually caused by a benign tumor on one or both of the thyroid gland's lobes. Although thyroid tumors can be cancerous, the chances are only 2% to 5% of malignancy in cats. 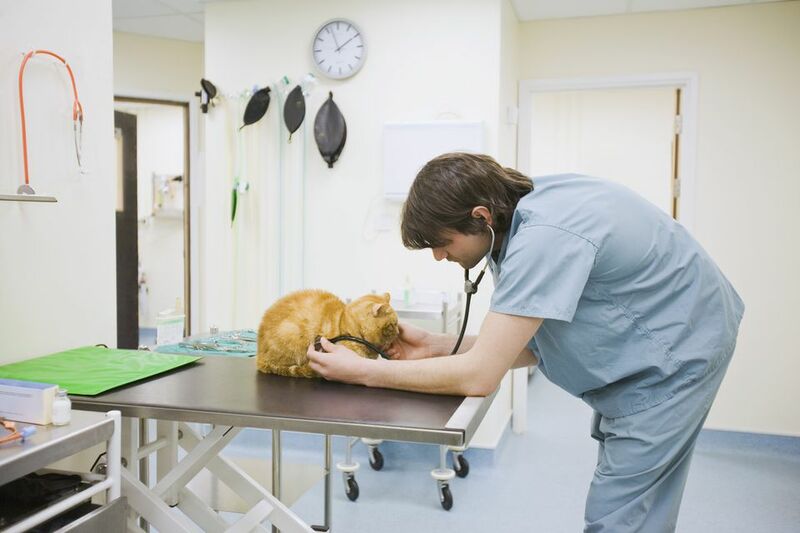 Physical Exam: The veterinarian will palpate the cat's neck area, and may feel the enlarged gland(s). Heart rate and blood pressure will also be checked. CBC: Since hyperthyroidism can mimic the symptoms of other diseases, such as CRF (chronic renal failure) or liver disease, a blood panel will usually show the "big picture," when combined with a thyroid-specific test, usually the T4, which will show thyroid levels. Elevated levels of T4 will usually strongly indicate the presence of hyperthyroidism. However, some older cats may fall within the "normal" range and still have the disease. When in doubt, other thyroid screening tests can be given. As hyperthyroid disease can predispose to other conditions, such as hypertrophic cardiomyopathy or hypertension, the blood panel will also reveal pertinent information on the heart and other organs, which is essential to know prior to choosing an ultimate treatment. Three basic treatments each offer a strong possibility of returning the thyroid gland to normal function. Each of them carries drawbacks, but fortunately, a caregiver does not usually need to make an immediate decision. This is almost always the first treatment, for reasons we'll discuss later. A typical drug given is methimazole, which controls the production of thyroid hormones. Many cats do quite well on methimazole, but it will have to be given once or twice every day for life, with regular tests to monitor hormone levels, so dosage can be regulated. It may be the least expensive treatment option, depending on the cat's age at onset. Methimazole is now available in three forms: Pills, flavored liquid form, or topical creams or gels which are gently rubbed inside the ear. The only treatment option for cats with kidney disease or hypertrophic cardiomyopathy. Side effects occur in some cats, including vomiting, anorexia, fever, anemia, and lethargy. A rare side effect is an allergy to the drug, presenting as a rash, often on the ears and face. More serious side effects from long-term use include liver damage and bone marrow suppression, although these are not often seen. Frequent veterinary follow-up is needed. The medication does not affect the tumor, which may keep growing. Some cats (and/or owners) cannot handle twice-daily pilling, and the attendant stress can exacerbate other physical problems. Surgery is an effective treatment, but it is best done by a veterinarian skilled in this type of surgery, called a "thyroidectomy." Surgery is most often indicated when only one thyroid lobe is involved. A radionuclide scan is indicated prior to the surgery to determine the extent of the diseased thyroid tissue, and to locate any extraneous thyroid tissue growing elsewhere in the neck (or chest) of the cat, which may contraindicate surgery. Because hypertrophic cardiomyopathy is sometimes present, a full workup is required to eliminate this potentially dangerous condition. Also, the cat must continue on anti-thyroid medication for 15 days prior to the surgery, so that renal function can be retested. Hyperthyroidism can cloak underlying renal disease, and the medication will return thyroid hormones to a normal level, which will allow existing kidney failure to be revealed. A cat with HCM or kidney disease is NOT a candidate for surgery. If both glands are involved, a second surgery is necessary. If only one lobe is removed, a recurrence is possible. Possible development of hypothyroidism(Can be treated with thyroid supplements). This is quickly becoming the treatment of choice in areas where it is available, and where the caregivers can afford it. A single injection of radioactive iodine (I-131) is given subcutaneously. The substance "finds" and destroys all diseased tissue, including any ectopic (outside the normal area) thyroid cells without harming any normal tissue. The cat must remain in the veterinary hospital for five days to two weeks (depending on state laws) until his radioactive levels are acceptable. Caregivers may be able to visit during that time, but will only be able to view their kitty through a special leaded window. The cat is also given the anti-thyroid medication for 15 days prior to treatment with I-131. As with the surgical option, a cat with hypertrophic cardiomyopathy, kidney disease, diabetes, or any other serious condition is not a candidate for radioactive iodine therapy. The subsequent development of hypothyroidism is a possibility, but it can be treated with thyroid supplementation. Cat feces and urine are considered to be radioactive for three months following radioactive iodine treatment. California State and Federal laws dictate the disposal of cat litter during that period.